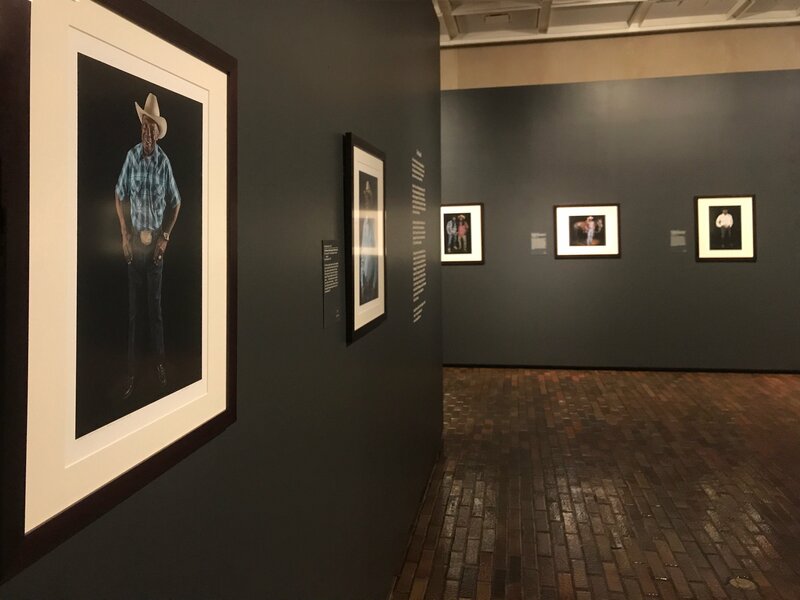 From severe glares to knowing smirks, Photographer Don Russell’s portraits, now on exhibit at the Stark Museum of Art in Orange, Texas, allow viewers a glimpse of each cowboy’s (or cowgirl’s) achievements, heritage, and mark on their culture. Focusing on the contemporary African American rodeo cowboys, the Portraits from Cowboys of Color spotlight the rich, but grossly overlooked, cowboy traditions still alive today. Thanks to the opportunistic combination of old growth timber, the Sabine River, and the proximity to the Gulf of Mexico, Orange, Texas became home to one of the South’s most prosperous turn-of-the-century timber operations. And subsequently, home to one of the nation’s most significant and impressive collections of Western Art. Through an array of bronze sculptures, Native Indian artworks, and exquisite paintings, the romance of the American West endures thanks to the generosity of timber baron, Mr. H.J. Lutcher Stark. 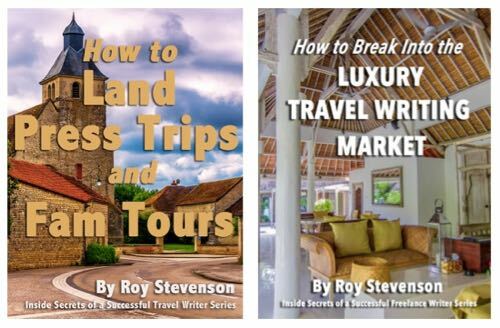 Inspired by his mother’s love of art, Lutcher Stark began expanding his personal collection while still attending the University of Texas during the 1920s. With keen interests in nature and Western art, Mr. Stark eventually amassed such a selection as to one day fill a 60,000 square-foot museum. Composed of bold lines, and broad open spaces, the white marble building of the Stark Museum of Art echoes many of the southwestern landscapes found within its walls. Particularly those on display in Gallery 3. Here, two original Georgia O’Keefe paintings, Not from My Garden and Gerald’s Tree II, hang alongside a melancholy portrait of the world renown painter. But not all the pieces of art are found inside the walls of the museum. Before entering, guests pass beneath the shadow of a 14-foot tall bronze sculpture of a Plains Indian offering a buffalo skull with prayers of preservation and dignity. Buck McCain’s The Invocation seems a fitting sentinel to the museum’s mission of conservation. 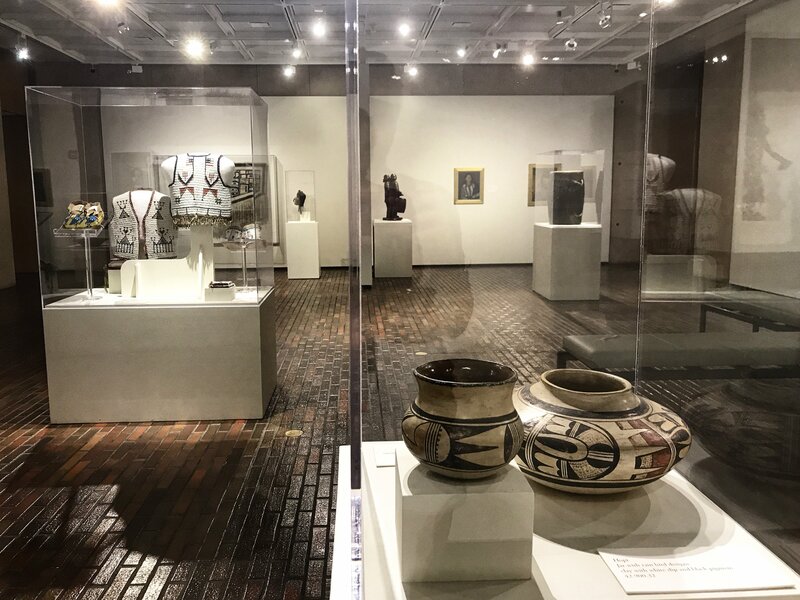 Besides boasting a staggering collection of original paintings, sculptures, and photographs, the Stark Museum of Art also houses collections of manuscripts, pottery, glassware, and rare books. 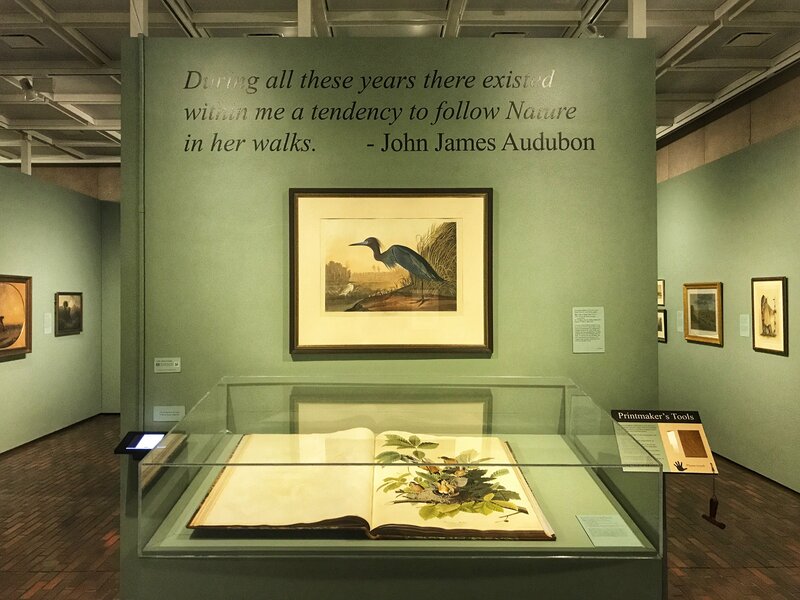 One such rare book is the five-volume set of John James Audubon’s Birds of America. This particular set, complete with an additional 13 etched composite plates, formerly belonged to Audubon himself. Scholars believe that only six sets were printed using the extra plates. These Audubon prints, together with moody, sweeping landscapes make up the first gallery. The largest of the four permanent galleries, ”Exploring America’s Frontiers” primes the visitor with an impression of discovery and wonder carried throughout the rest of the exhibits. 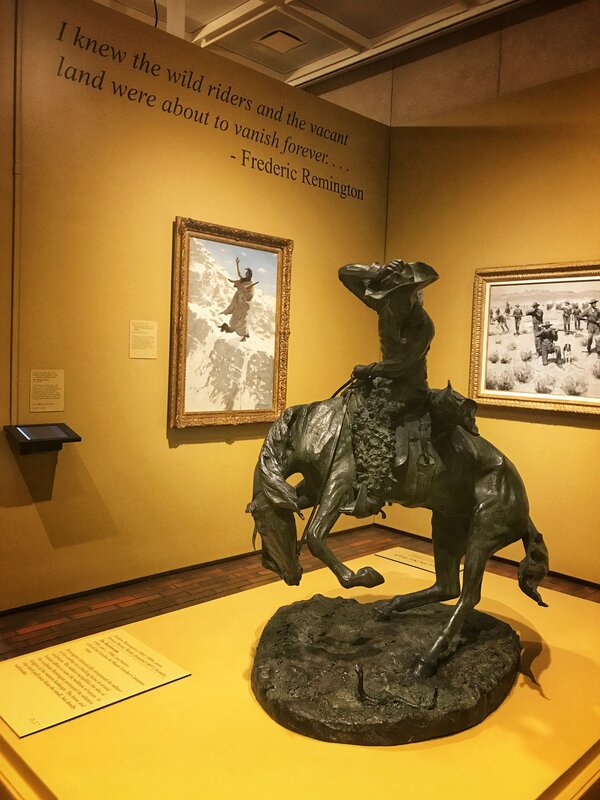 From “Exploring America’s Frontiers” visitors seamlessly move into the second gallery, “Picturing the Wild West”. Here, stoic Native American portraits hang alongside the dynamic and dramatic scenes of everyday life on The Frontier. “Portraying an Idyllic Place”, Gallery 3, takes an intimate look at the vibrant people and quiet moments found in the West before transitioning into the “Arts of the American Indians” showcases. But the last gallery is where you’ll find unique, ever-changing exhibitions. Twice a year, the Stark Museum of Art welcomes recent exhibits to complement their prestigious collection. 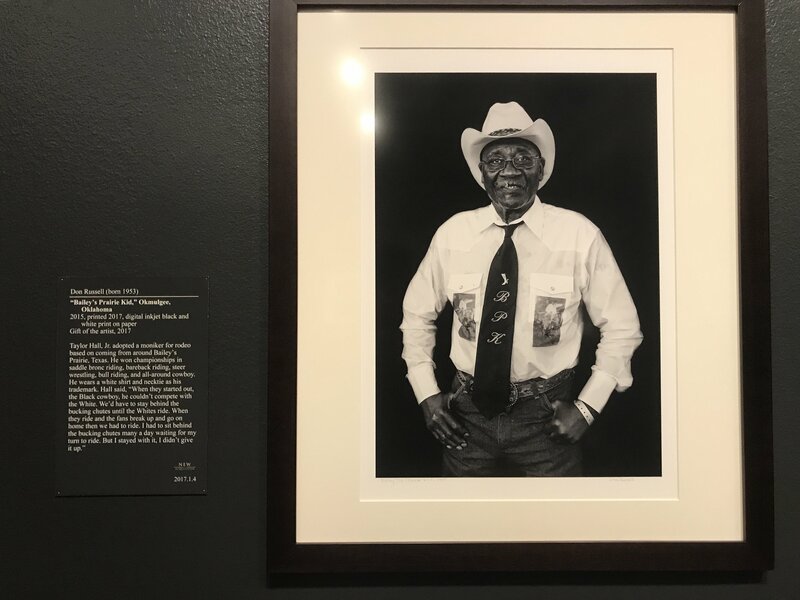 Gifted to the museum by Mr. Russell, 21 portraits make up the Portraits from Cowboys of Color: Photographs by Don Russell collection currently on display. They will also find talents such as Jerry Diaz. A fourth generation charro, Diaz performs specialty trick riding acts for rodeos as well as produces The Mexican Rodeo Extravaganza. 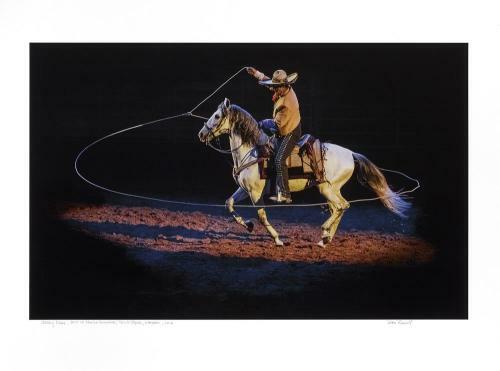 Displaying masterful horsemanship and expert roping feats, Diaz holds numerous awards including theFederation of Charros’ Golden Spur Award. And then there’s J.W. Hutson, who after a career of teaching, acting, bronc riding and calf roping, now judges rodeos. 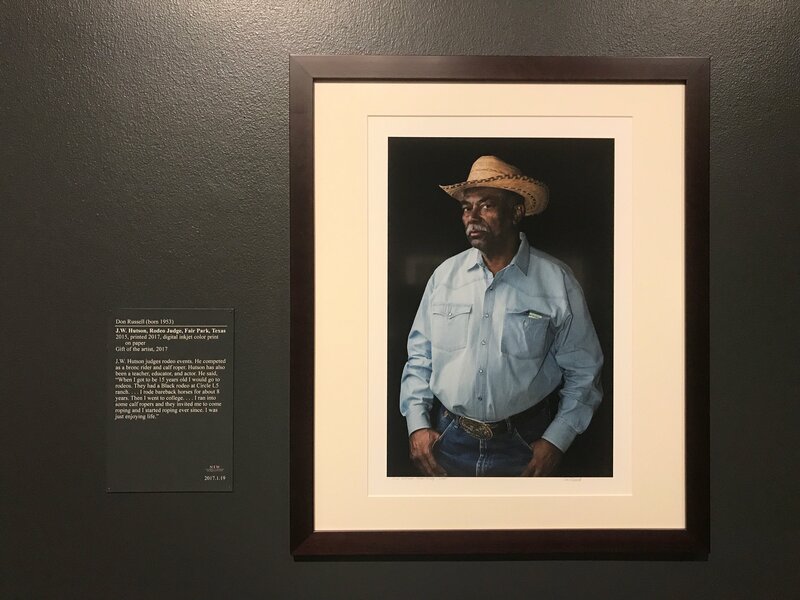 The Portraits of Cowboys of Color will remain on Display until Saturday, September 29th. The Stark Museum of Art is located at 712 Green Avenue, Orange Texas and is open from 9a.m.-5p.m. and closed on Sundays and Mondays. Admission to the museum is free.